116 THE SHOP NOVEMBER 2018 Petersen, of course, was the founder of HOT ROD Magazine and the resulting Petersen Publishing empire. The initial Petersen donation was used to refurbish the old 7,000-square-foot Frank Hawley School of Drag Racing facility at Fairplex (alongside the Pomona drag strip) into the new AXC Robert E. Petersen Garage, complete with workshop, a 1,400-square-foot, standalone classroom and, coming online soon, a 1,000-square- foot paint booth. The following year the Petersen Founda- tion made yet another significant endow- ment. As welcome as those donations were, the school is not beyond helping itself. Indeed, it must, and in 2016 the industry got behind an L.A. Roadsters' 50th Anniver- sary Hi-Boy project to recreate the famous Bob McGee '32 Roadster that graced the cover of the October 1948 issue of HOT ROD. Throughout the 14-month build AXC students were involved at key times in order to help them better understand how a tra- ditional hot rod comes together. The Road- ster, a stunning testament to the program's ability, was auctioned off at Barrett-Jackson where it fetched $105,000. The proceeds went directly back into the AXC program. AXC students also participated in a Chip Foose-designed Ford F-150 Lariat project with WD-40. The truck was likewise raffled off, with proceeds going to three SEMA Cares charities: the SEMA Memorial Schol- arship Fund, Childhelp and Victory Junc- tion. A NEW SPARK Sadly, Chapouris died unexpectedly early in 2017, leaving an exceptionally large void in both the hot rod industry and on the AXC steering committee. His untimely passing coincided with yet another donation from the Petersen Foundation. The intention all along had been to establish a welding school alongside the automotive department. Chapouris had been a talented welder and understood that it was his skills as a fabricator that enabled him to become one of the world's most preeminent hot rod builders. And the key to his success was being able to weld. (And, of course, the ability to weld is not relegated to the auto business; it can be the key to many jobs in many industries all over the world.) With Chapouris' passing and Xydias' blessing, it was unanimously decided to change the name of the school to the Alex Xydias & Pete Chapouris Center for Auto- motive Arts at Fairplex. Heck, even the logo thankfully reflected an A for Alex and a C for Chapouris. 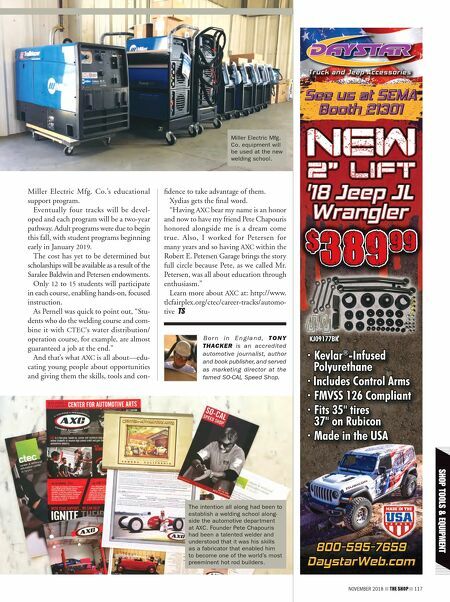 It was decided then that with funding from the Petersen Foundation a new welding school would be built alongside the auto school in the Petersen Garage. "Mr. Petersen came up the hard way and he understood the need to be hands-on," said Gigi Carleton, administrator of the Founda- tion. 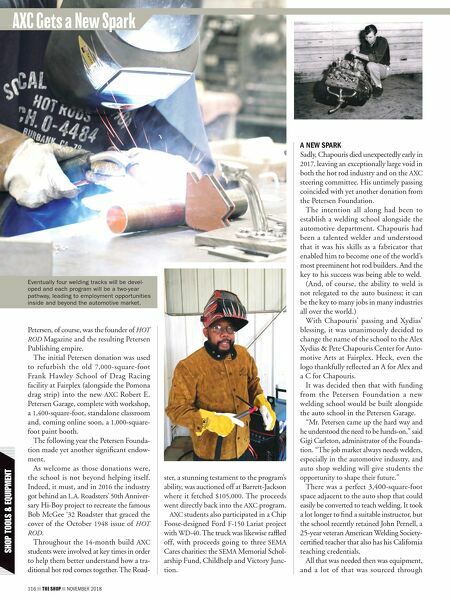 "The job market always needs welders, especially in the automotive industry, and auto shop welding will give students the opportunity to shape their future." There was a perfect 3,400-square-foot space adjacent to the auto shop that could easily be converted to teach welding. It took a lot longer to find a suitable instructor, but the school recently retained John Pernell, a 25-year veteran American Welding Society- certified teacher that also has his California teaching credentials. All that was needed then was equipment, and a lot of that was sourced through AXC Gets a New Spark Eventually four welding tracks will be devel- oped and each program will be a two-year pathway, leading to employment opportunities inside and beyond the automotive market.